Sydney was our last stop on our round-the-world trip, and we have plenty of amazing memories from living “Down Under.” Now ’til the end of October, we’re going to be recalling our favorite Sydney moments. At the end of each post, you’ll find out how to get the chance to make your own memories in Oz by entering to win a trip to Sydney. The famous Coastal Walk from Bondi to Bronte is a great way to get a taste of beach culture Down Under. A new friend offered to lead us on the five-kilometer, two-hour trail. If you’re doing it alone, the path winding around the ocean is well-marked so it’s pretty tough to get lost. Starting in the north by the Bondi Golf Course and turning left onto Ramsgate Ave, we arrived at probably the most well-known of the beaches near Sydney named Bondi. Families were relaxing on grassy patches with picnic lunches and runners were doing laps on the sand. We took our time taking in the craggy bluffs, gemstone-blue waves with surfers bobbing up and down, and Aboriginal rock engravings. At the edge of Bondi Beach a pool was carved right into the rocks. Filled with saltwater, it allows swimmers to do laps without the danger of getting caught in a riptide. We climbed the steep stairs past Bondi Icebergs, a trendy restaurant and bar with hanging chairs, cozy couches and one of the best views we’ve ever seen from a bar. 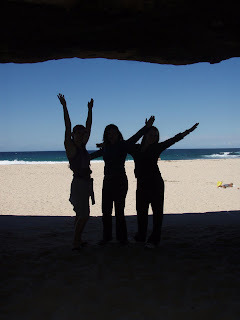 The view around the bend at Tamarama Beach was even more spectacular. 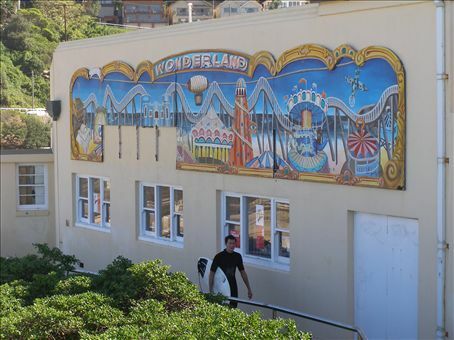 Plunging rocks and crashing waves faced us as we climbed down the stairs and past a Technicolor mural entitled “Wonderland.” This beach used to be some kind of amusement park back in 1877-complete with roller coasters, tight-rope walkers and even a lone penguin. The last beach on this particular walk is Bronte, and it’s different from the others because it has a freshwater creek overlooked by a popular cafe where walkers can grab coffee and people watch. There’s also another set of baths to protect swimmers from strong ocean currents. We decided to extend the walk and find out what was around the next bend. We were surprised to come across not another beach filled with surfers and families, but to a graveyard high on a cliff, overlooking the ocean. We tried to read stories on the grave makers as we walked by Waverly Cemetery, examining the sun-bleached, weathered gravestones. Some dated as far back as the 1800s and were impossible to read, while others were carved as late as the 1990s. If you’re looking for somewhere less crowded than Bondi to lay down your towel, keep walking to Coogee Beach. 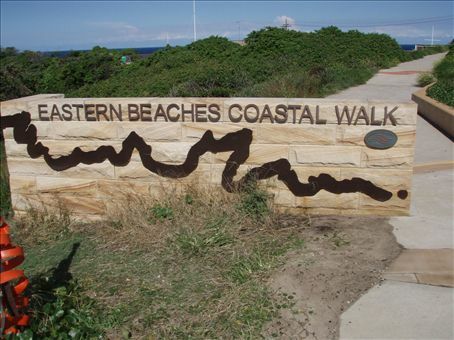 It has lots of little restaurants and grassy patches lining the sand, and there’s Wylie’s Baths at the southern tip were where you can do some laps or just cool off at the end of your scenic walk. On the Sydney, Australia Facebook Wall write in 30 words or less about a Sydney experience you’ve had, or would want to have. Sydney Harbor Bridge: The Climb of Our Lives! You've made it sound so fantastic, I am totally going to enter! Thanks for the tip!